The A-2 was a single-note horn used primarily on switchers. It had both a long bell and short bell version (15 in. and 11-5/32 in. respectively). When used singly, the long bell was generally the one used. Wabco also produced a two-chime AA-2 horn which combined a long and short bell A-2 on a common manifold. The A-2 was fairly common on Alco switchers of many railroads. Wabtec was still offering the A-2 as of 2001, but no large railroads are known to have purchased any. As with all Wabco horns, A-2's are rare to find in service today. They may still be found on older switchers or museum locomotives. My WABCO E-2 in a Sherry' Durango runby. 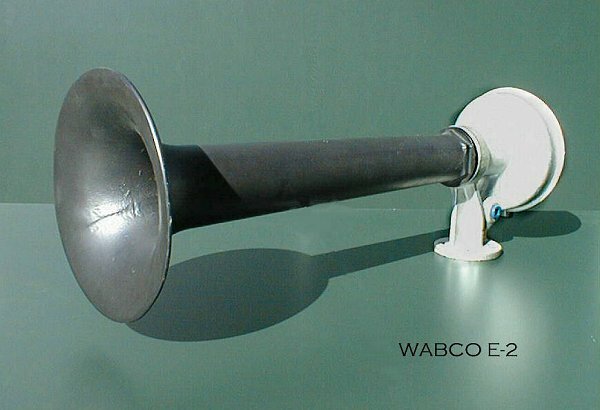 The E-2 was Wabco's single-note deep horn for road locomotives. It was popular in the early years of dieselization, especially on Alco and Fairbanks Morse locomotives. Milwaukee Road's "Little Joe" electric locomotives were also fitted with E-2's. The horn could be used singly or in pairs, with one horn facing forward and one to the rear. 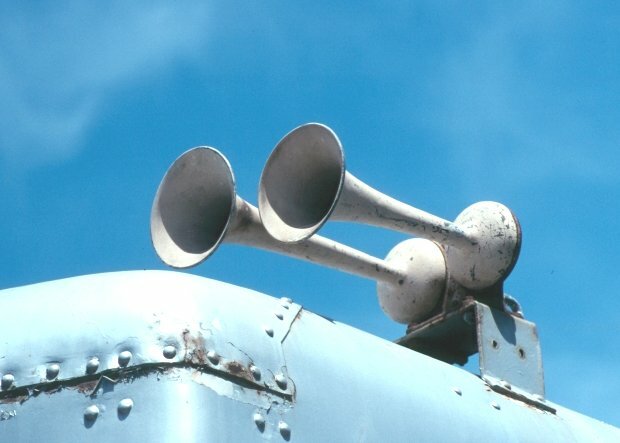 The E-2 was less popular than its competition, the Leslie A-200, and like the Leslie, it fell out of favor with the advent of multi-chime airhorns. E-2's are rare to find in service today except on museum locomotives. The Newburgh & South Shore, a switching railroad located in Cleveland, OH, had an unusual horn mounted on one of their locomotives in the mid-90's. It consisted of a Wabco E-2 and a pair of smaller horn bells mounted to the right of the E-2 on the roof of the locomotive. The horn was a homemade arrangement cobbled together from second-hand single-note honkers of varying pedigree. The sound is not likely to be confused with anything else. 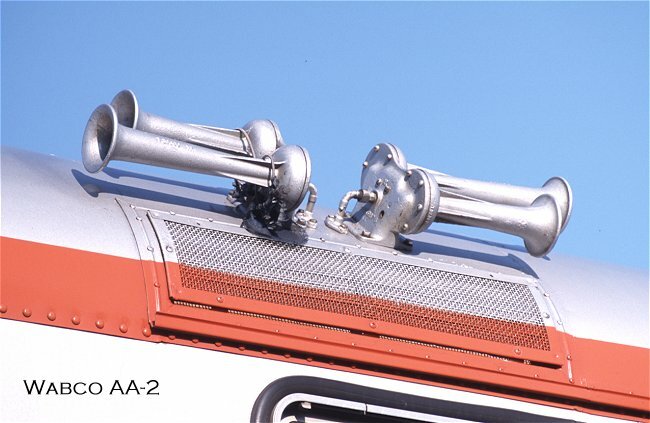 The AA-1 was an early Wabco two-chime airhorn used primarily on interurban equipment and some early locomotives and railcars. It was presumably a combination of long and short bell A-1 horns on a single manifold. The AA-1 was still available in 1936 when San Francisco Bay Area transit operator Key System outfitted its new "bridge unit" articulated cars with the horns. The horn was presumably phased out with the introduction of the AA-2. Documentation of the factory tuning of the AA-1 has not yet been uncovered. Surviving horns on Key System bridge units at the Western Railway Museum at Rio Vista Junction, CA appear to play E and G#. A few AA-1's survive on preserved electric interurban equipment. 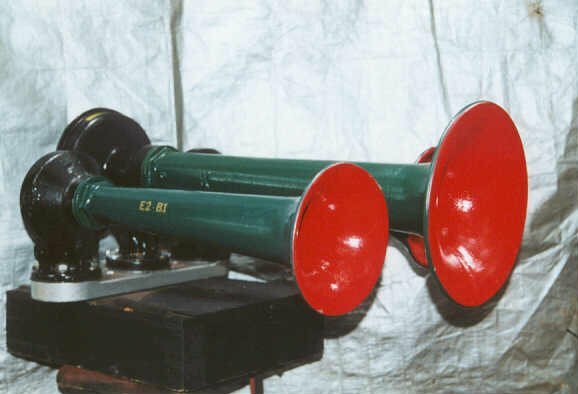 The AA-2 used the short and long A-2 bells on a common manifold to create a two-chime airhorn with a pleasing perfect 4th interval. The horn appears to use the same back cap as its predecessor, the AA-1. The horn's most common application was probably on commuter equipment. Chicago & North Western and Rock Island both used paired AA-2's on cab cars for their Chicago, IL push-pull commuter service (photo above), and Chicago South Shore & South Bend and New Jersey Transit both operate electric multiple unit railcars fitted with AA-2's. 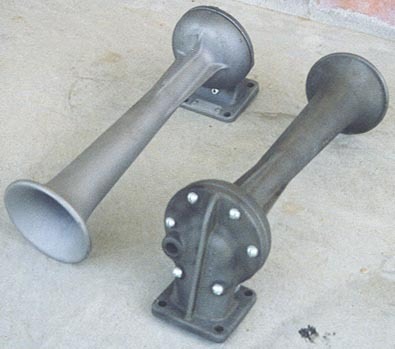 The horn has also been used on industrial locomotives. Wabco's corporate successor Wabtec was still offering the AA-2 as of 2001, but few railroads have purchased them in recent years. Chicago commuter authority Metra still has some cab cars with paired AA-2's, and some survive on NJ Transit cars as well as scattered industrial locomotives. 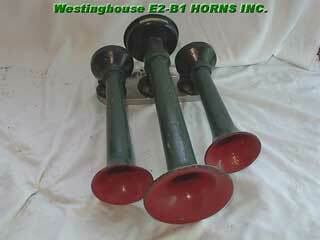 As early as the late 1940's, WABCO had a series of three chime "E-2B" airhorns available. The horns consisted of various E and B-series "pneuphonic" horn bells attached to a common manifold, with the two outer bells angled 3 degrees outward relative to the center bell. The E-2B horns never achieved much market penetration, but a few did find their way onto locomotives. The E-2B-1 was probably the biggest seller of the line. It featured a large E-2 bell in the center, flanked by a B-7-21 and a B-7-25 bell. The combination of tones wasn't any particular musical chord, but was an handsome, deep sound nonetheless. It is unlikely that any E-2B-1's survive on active locomotives, but thankfully several have been preserved in private collections. The E-2B-3 was the highest pitched horn of the E-2B line. As with the E-2B-1, it consisted of several WABCO single note "honkers" bolted to a common manifold, in this case the stubby E-44 bell flanked by a B-7-30 and a B-7-36 bell. The E-44 bell could be reversed (turned backwards) if desired. The E-2B-3 wasn't popular in railroad service. A picture exists showing an E-2B-3 on the roof of Alton & Southern RS-3 #34, and Louisville & Nashville had them on a few locomotives as well. It is unlikely that any survive on locomotives today. An audio file of Bill Williamson's WABCO. 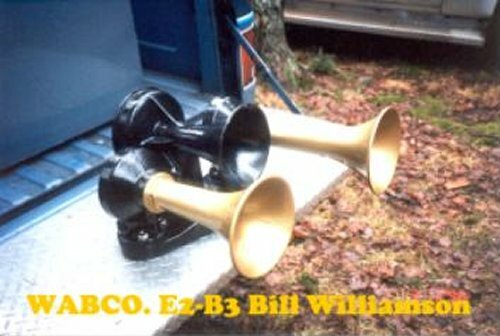 E2-B3, recorded by me back in 1996 at a horn get together at Thornhurst, Pa. This horn has a characteristic "steam boat" sound to it.